Looking for an easy summer recipe – one that won’t heat up the house or expand your waistline? Every Monday I’ll be posting light summer recipes. Today’s recipe is Lemony Pesto Chicken Kebabs. Super light. Refreshing. Delicious. Serve it up with some rice or a fresh summer salad. Combine zest, lemon juice, garlic, oil, salt and pepper. Toss with chicken. Thread vegetables and chicken onto 4 (12-inch) skewers. Throw on the grill until center of the chicken is no longer pink. TIP: Vegetables getting done much quicker than the meat? Place them on separate skewers (see below). Then you can pull the vegetables off while the meat finishes cooking. Have leftovers? Toss it in a salad for dinner the next night. This chicken recipe looks PERFECT for summer. I think this is my first time to your site. LOVE the name and your header is awesome! 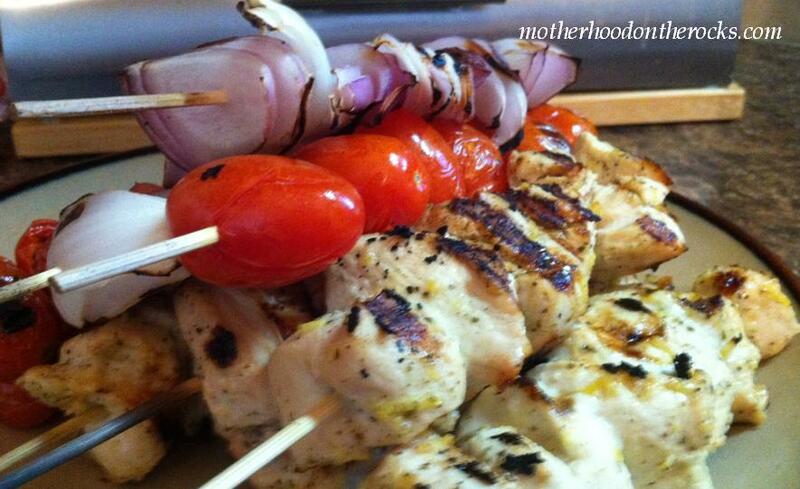 Thanks for participating at Tempt My Tummy Tuesday and sharing your lemony pesto chicken kebabs. I can’t wait to try them. I like this! Something savory and light. I have pesto at home, still have to buy the lemon and tomatoes. Made this and I loved it!